Successfully Added Conquest S6FP IP68 Smartphone - Quad Core CPU, 3GB RAM, 5 Inch Screen, Gorilla Glass, 4G, OTG, NFC, Fingerprint Sensor (Black) to your Shopping Cart. The Conquest S6FP is a water and dust resistant smartphone able to withstand submersion in water for up to 30 minutes and protected with Gorilla Glass 4 9H hardness glass, it is able to handle the roughest and toughest conditions like a champ. The tough rubberized and reinforced body means this rugged phone can stand up to scuffing, scratches and shake off impacts - the result is a Smartphone that truly desires the title hard as nails. With precision screws holding everything down and a tough trim the conquest easily matches the IP68 requirements. The optional extra memory micro SD card slot, as well as the 2 micro 4G SIM slots, are all located behind a rubber sealed and a screwed down rear plate. The 3.5mm headphone jack, micro USB port are likewise protected by rubber plugs to prevent any water ingress. A 5 inch HD display means you'll be able to enjoy around 300 pixels per inch so you're guaranteed great resolutions, utilizing IPS technology gives you better viewing angles so even in bright sunlight or wide angles the screen is easily viewable. this 5 inch display strikes a good balance and is just the right size for playing games, watching movies and surfing the web while keeping the phone easy to hold and use. Powered by a 1.3Ghz CPU that backed up by 3GB of RAM ensures the Conquest S6FP phone will deliver a fast and reliable performance. there is huge 6000mAh battery built into this rugged phone that when fully charged bring you around 16 hours of talk time. Because of the OTG abilities, you can even use this to recharge other devices such as a second phone, smart watch or music player. Fingerprint Sensor and NFC are both present on this rugged phone so simple quick data transfer for swapping contacts, authenticating payments and transferring data is a doddle. Ideally suited to your outdoor activities the S6FP rugged smartphone can snap stunning shots with the 13MP rear facing camera so you'll be blessed with great photos to remember all your adventures by. 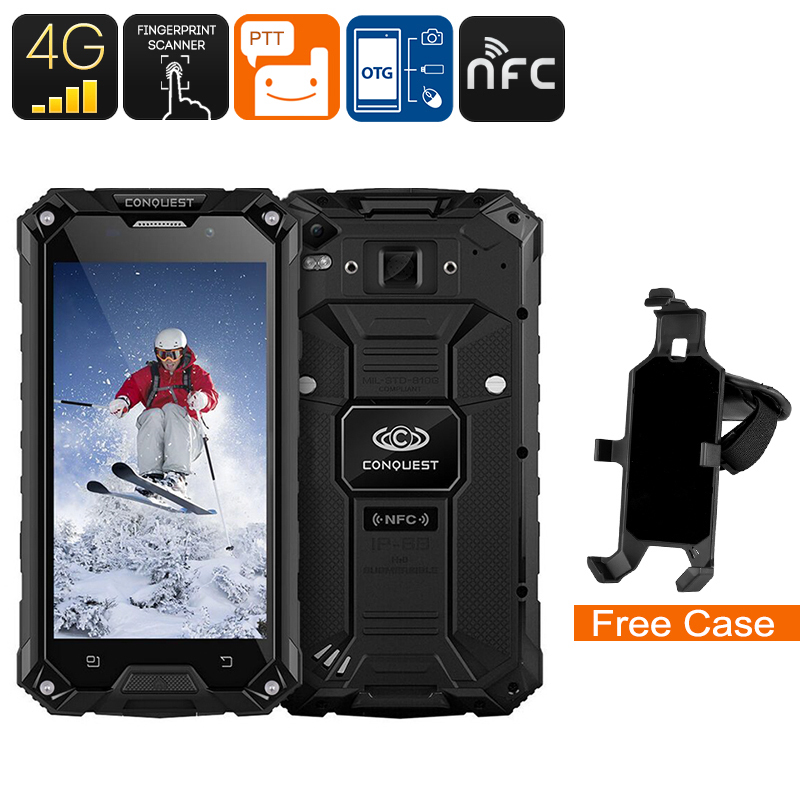 The Conquest S6FP Android rugged phone comes with a 12 months warranty, brought to you by the leader in electronic devices as well as wholesale Android phones and outdoor gadgets..